GeneFluidics is the only group selected for both NIAID antimicrobial resistance diagnostics projects (https://www.nih.gov/news-events/news-releases/nih-funds-nine-antimicrobial-resistance-diagnostics-projects) and as finalists for the NIH AMR Challenge Step 2 (https://dpcpsi.nih.gov/AMRChallenge/Finalists). Duarte, CA, December 05, 2018 --(PR.com)-- GeneFluidics is pleased to announce that they have been selected as one of five finalists for the Antimicrobial Resistance Diagnostic (AMR) Challenge Step 2 by National Institute of Health (NIH). The main purpose of the Antimicrobial Resistance Rapid Challenge is to incentivize the development of in vitro diagnostic tests that would be of significant clinical and public health utility to combat the development and spread of antibiotic-resistant bacteria or diagnostic tests that distinguish between bacterial and viral infections. From the group of five Step 2 finalists, up to three winners will share at least $19 million. Winners will be announced on July 31, 2020. GeneFluidics is the only group selected for both NIAID antimicrobial resistance diagnostics projects (NIAID antimicrobial resistance diagnostics) and as finalists for the NIH AMR Challenge Step 2. “Antimicrobial resistance is a serious global health threat that is undermining our ability to effectively detect, treat and prevent infections,” said NIAID Director Anthony S. Fauci, M.D. “One way we can combat drug resistance is by developing enhanced diagnostic tests that rapidly identify the bacteria causing an infection and their susceptibility to various antimicrobials. This will help physicians determine the most effective treatments for infected individuals and thereby reduce the use of broad-spectrum antibiotics that can contribute to the drug resistance problem.” GeneFluidics has also finalized the validation and clinical testing plans for our first FDA submission, and clinical testing at Children's Hospital Los Angeles, Mayo Clinic and Johns Hopkins will be initiated in 4Q 2018 to support its planned application for 510(k) regulatory clearance to market ProMax® in the U.S. The Company expects to complete the study for submission in 1Q 2019. The emergence and rapid spread of resistant bacteria has become a serious public health concern worldwide. Delayed antimicrobial therapy significantly increases mortality in high-risk infections with a particularly strong association with septic shock. Therefore, antimicrobial agents are often injudiciously used without any evidence-based microbiological confirmation. Antibiotic consumption is strongly linked to the emergence and dissemination of antibiotic-resistant bacteria strains in several epidemiological studies. According to CDC’s recent publication, an estimated 30% of outpatient oral antibiotic prescriptions may have been inappropriate, and up to 70% of the “appropriate” prescriptions still require improvements in selection, dosage and duration to delay the development of antibiotic-resistant bacteria. The vast majority of antibiotic prescriptions are made by physicians outside the hospital setting without the use of a sophisticated diagnostic device. The UtiMax Lab Automation System is a fully automated rapid diagnostic system for the identification of uropathogens directly from urine samples. Identification (ID) and antimicrobial susceptibility testing (AST) are performed by the UtiMax™ Lab Automation System with a reagent kit and disposable sensor array chip. UtiMax ID/AST is an electrochemical-based sandwich hybridization test to quantify species-specific ribosomal 16S ribosomal RNA (rRNA). Each sample is lysed chemically prior to hybridization at high stringency. A built-in multi-channel potentiostat reads the electrical current from the steady-state enzymatic cycling amplification: signal is proportional to the bound 16S rRNA content from lysate and reported in ranges of colony forming units (CFU) per milliliter through an established calibration curve. A compact and rapid pathogen identification (ID) and antimicrobial susceptibility testing (AST) can address both the unnecessary use and overuse of antibiotics, and therefore effectively reduce antibiotic microbial resistance. GeneFluidics' overall goal is to deliver a molecular diagnostic platform that is capable of rapid diagnosis of common bacterial infections in as short as 30 minutes and profiling their antibiotic resistance in as short as 90 minutes. Their product will lead to more rational use of antibiotics and will reduce the development and spread of multidrug-resistant pathogens. Their goal is to obtain the first FDA clearance of UtiMax, a rapid urinary tract infection ID/AST test currently in the pilot production stage, through an FDA de novo submission. A follow-up product line, BsiMax (with additional feature of lysis centrifugation), can process whole blood samples for bloodstream infections with a limit of detection (LOD) < 4 CFU/mL. Both UtiMax and BsiMax can be performed by our robotic liquid handling systems, with associated reagent kits and sensor chips. Intended Use – BsiMax and UtiMax are rapid diagnostics tests to identify blood borne pathogens (BsiMax) and uropathogens (UtiMax) directly from patients’ whole blood or fresh urine samples. The BsiMax and UtiMax ID/AST tests can quantify the unique species-specific nucleic acid sequence associated with each target pathogen without using PCR and conduct antimicrobial susceptibility testing (AST) without a need of obtaining a clinical isolate or positive blood or urine culture sample. GeneFluidics was incorporated in 2000 to develop a fast, accurate, and simple testing system for improving worldwide healthcare. By integrating novel molecular analysis and lab automation technologies, the company's revolutionary platform enables complex tests that are normally performed only by skilled technicians in a laboratory to be performed by anyone, anywhere. 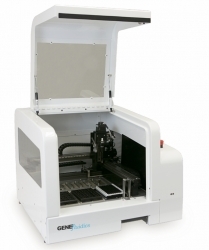 GeneFluidics is committed to improving the quality of human life with advanced engineering and molecular analysis technologies. ProMax AST only system. Isolate to AST results in 3 hours. UtiMax ID/AST direct from urine application note. Pathogen identification and antimicrobial susceptibility testing directly from urine. Pathogen identification and antimicrobial susceptibility testing directly from whole blood. Click here to view the list of recent Press Releases from GeneFluidics Inc.